Loughgall added to the summer signings with three fresh additions last night (Wednesday) as the Villagers finished at 1-1 against top-flight Glenavon. However, one of last season’s transfers - Matthew McMahon - took centre-stage with a late equaliser for Loughgall. Stephen Hawe, Loughgall’s joint manager alongside Steven Uprichard, confirmed the capture of Matt Sadlo, Mark Dane and Dylan Byrne. “We got three players signed up, which is great for the club’s pre-season plans,” said Hawe. “However, credit also to Matthew for his goal after getting two last weekend against Bourneview YM. “Gary Henderson was also excellent in midfield and we can now travel to Magherafelt Sky Blues on Saturday with confidence at continued development. “In terms of the signings, Matt has experience of second-tier football in Poland and is a strong defender who has settled well. 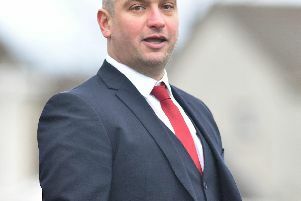 “Dylan and Mark have both come from the Mid-Ulster Football League, with John Uprichard another signing this summer out of that level. LOUGHGALL: Gareth Buchanan, Matt Sadlo, Ricky Copeland, Nicky Hudson, Wilson Favares, Gary Henderson, Steven Ferguson, Aaron Willis, Wesley Boyle, Mark Dane, Matt McMahon. Subs: Bill Morrow, Aaron Black, Dylan Byrne.